Entries will be accepted through September 30, 2013 (The contest time period is when entries can be submitted. Photos can have been taken at any time). An online entry form and upload functionality will be available during the period of the contest. Winners will be announced before the end of November, 2013. The Shooting Alpine Photo Contest is free and open to everyone. Only judges and organizers of the contest are ineligible. Photographs are judged anonymously, and no entrants’ names are available to the judge at any time until after all awards are granted. Entry in the contest grants the City of Alpine license to use any entered photographs, with credit, for promotional purposes related to the City of Alpine. Photographs taken within the City of Alpine are preferred, but its surroundings are also eligible subject matter for submitted photos. “Surroundings” includes the valley and mountains around the city and the roads and ranches between Alpine and its neighboring towns. Photographs of subjects beyond this range will be disqualified. Submitted photographs must be the work of the entrant, and not previously entered in the Shooting Alpine Photo Contest. They may be in color or black & white. Photo collages, composites, or photographs with text overlays will not be considered. Entries should be in jpeg format. Recommended image size: 8 x 10” at 300ppi (2400 x 3000 pixels), or larger (NOTE: 8 x 10″ is not a required format; the images can be any shape). Minimum image size to enter: 8 x 10” at 72ppi (576 x 800 pixels). PLEASE NOTE: Photographs must be at least the recommended image size to be considered for the $100 or $500 prizes. Images below the recommended image size will be considered for recognition in the web gallery and for the $50 prizes. Participants are limited to five (5) entries only. If more than five photographs are submitted, the first five will be entered into the contest, and the others discarded. Contest photos in the online gallery are presented for fine art purposes. The City of Alpine may request model release forms if any photo with a recognizable likeness is considered to be used in promotional materials. If the judges determine that no submitted photograph is of sufficient quality to award one or more of the advertised prizes, those prizes will not be awarded. 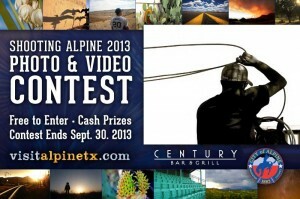 Any questions about the contest should be directed to photos@visitalpinetx.com.